If you study this sketch, you can clearly see I was struggling with this face. It is supposed to be a toddler, but I have aged him a few years. It is a good sketch, just without a good likeness with the reference photo. The main problem, I think, are the position of the ears. Also notice that the ears are of different size and shape. This is a flaw in this sketch, and one which made it somewhat less than the other sketches I did today. On the positive side, the tilting of the head is practically spot on. You could ask yourself, why be so critical on yourself, why not just draw a pretty face? Well, if I’m going to draw people from life, I should be at least able to draw correctly from a photograph. I’ve seen too often that artists did a free impression of someone’s face, or (worse) stylizing it, making it into a pretty picture instead of a portrait that tells something of the person that is being portrayed. Well, I have some sketches to go. This was number 61 out of a thousand minus one sketches (1 through 999). 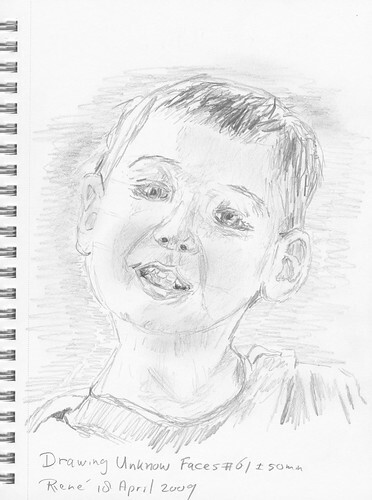 It was based on a photo I found on the Flickr public photo stream, and was made in 50 minutes with an HB drawing pencil.